Okay, so the last time I made a post about lining knit hats with satin bonnets, I got a response about losing edges with satin bonnets that have elastic bands. 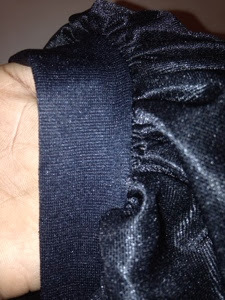 Please make sure your satin bonnets have a BROAD band as opposed to the elastic band. I know from experience, that the ones with elastic bands will rake out your edges. It happened to my daughter. 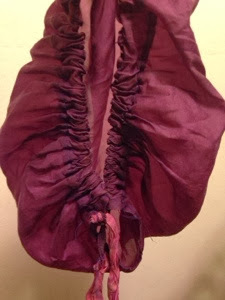 I got this beautiful purple bonnet for her, pictured above, which was designed for kids, however, it has an elastic band and I could not figure out why she had a receding hairline for a while until I just simply realized that it was this purple bonnet. Of course you can adjust the elastic, but the bonnet will not stay. So what is the point? Really? 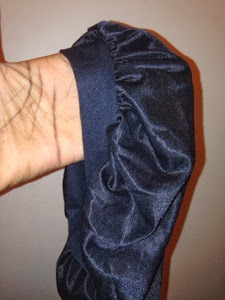 If you want to keep your edges, stay away from bonnets with elastic bands. 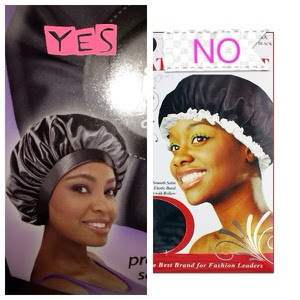 The name of the bonnet I recommend is "Stay On Satin". 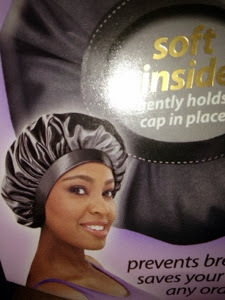 I have been using this kind of bonnet for more than 5 years. I love it because it actually protects your hair and edges. You don't have to worry about breakage and headaches. Besides, it stays on firmly and it is not tight at all. Do you see how broad the band is? It is not tight and it stays on. Besides, and more importantly, moisture is retained in your hair and breakage is put at bay. If anyone is interested, it costs $3 and I purchase mine always from Duane Reade, in the section, where black hair products are sold. I definitely learned this lesson the hard way! I understand! My poor baby had no hairline for a while. Unfortunately, the purple one did not work for us and it was expensive for a bonnet. Though I use something completely different to protect and tie my head at night, I see this as an important public service announcement. Sorry to hear about your daughter's hairline . . . luckily, it will grow back. Thank you for sharing your experience . . . Thank you! Thank God that her hairline has grown back. This was a while back but I never made a post about for whatever reason. Probably because I did not want to indicate anything that was negative of the company. Thanks for replying my comment with this post. Unfortunately, we don't get to see the type you recommended in Nigeria. I wish I knew how to make them and so I could do a tut. Well, there are always scarves in the silk material.